US Senator Politicizes National Guard-NFL Team Sports Marketing – StratGo Marketing. Plug-in marketing department services. Controversy has arisen about marketing sponsorship programs between NFL teams and the National Guard/Department of Defense. It’s part of his #PorkChops series highlighting what he perceives to be government waste. The story was reported locally in New Jersey on May 8th (Christopher Baxter and Jonathan D. Salant of NJ Advance Media for NJ.com). Let’s explain what happened and then assess. 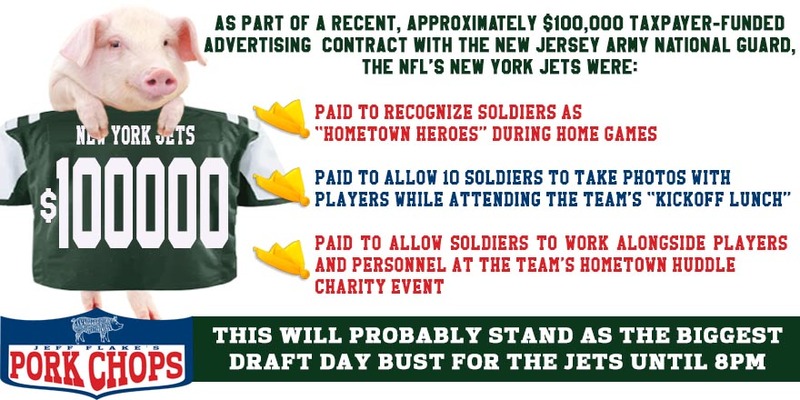 The New Jersey National Guard (NJARNG) paid for a marketing sponsorship with the New York Jets the past four seasons (2011 to 2014). The components were relatively standard fare for sports sponsorships. Allow 10 NJARNG Soldiers to attend the Jets’ Annual Kickoff Lunch in New York City. At the luncheon, the Soldiers will have the opportunity to meet and take pictures with various members of the Jets organization for promotional use for recruiting and retention purposes for the NJ Army National Guard. In-stadium branding on monitors; Facebook social media promotion. Allow NJARNG to participate in the Jets Hometown Huddle charity event in which Jets players and coaches will work side by side with the Soldiers to build or refurbish a community asset. i.e., build a new playground, rehab an existing park, etc. for promotional use for recruiting and retention purposes for the NJ Army National Guard. Use of Atlantic Health Jets Training Center for up to 100 attendees to conduct formal meeting or event. A videoboard feature – Hometown Hero. For each of their 8 home game, the Jets will recognize 1-2 NJARNG Soldiers as Home Town Heroes. Their picture will be displayed on the videoboard, their name will be announced over the loud-speaker, and they will be allowed to watch the game, along with 3 friends or family members, from the Coaches Club. Total payments from the Department of Defense and the New Jersey National Guard to the Jets over four years were $377,000. What’s so controversial, you may be wondering? After all, we’re used to seeing a variety of marketing communications geared to promote recruitment for the various branches of the armed forces and to keep brand awareness strong (no complaints for The Few, The Proud, The Marines, I don’t think). When we cut to the chase – shock and awe – politics are driving this controversy! To begin, Flake’s press release is sensationalized, incomplete and out of context. Credit: Senator Jeff Flake press release. Second, the Department of Defense has every right to use marketing tactics, including sports team sponsorship, for recruitment and retention. It’s a smart way to reach their target audience and get the message out about the wonderful opportunities that serving in our country’s military can provide. “Those of us go to sporting events and see them honoring the heroes. You get a good feeling in your heart. Then to find out they’re doing it because they’re compensated for it, it leaves you underwhelmed. It seems a little unseemly.” (Interview with Baxter and Salant). Now, this part of the sponsorship is fair game for debate. I know exactly what the Hometown Hero feature is because I attend Jets football games. It’s a great moment – very patriotic. I stand. Everyone stands and applauds. Sometimes there are USA! USA! chants. It’s a well-deserved recognition for the soldiers. Okay, let’s review the total sponsorship from the perspective of the stakeholders. If you’re the New York Jets, you understand that your business is the entertainment business. If you do it well, other companies and organizations will pay to get the benefits of associating with your brand. Creating and selling such marketing programs is well-accepted around the world. You should rightly feel good about a continuing, four-year partnership with a paying sponsor – it must be beneficial for both parties. Now, do the Jets also derive some polish for their own brand as result of being perceived to honor the military? For sure. Could they have been more transparent about the transaction? I suppose, but cannot give an immediate, clunk-free way to communicate that the Hometown Hero honors are part of comprehensive, sports marketing sponsorship. For example, it’s not as easy as the “paid advertisement” disclaimer you’ll see in a newspaper or magazine (although, theoretically, they could put such a statement on the video board). So, maybe next time we’ll hear this from the public address announcer, but is it really necessary? Ladies and Gentlemen, please turn your attention to the end zone. As part of the National Guard’s paid sponsorship with the New York Jets to help recruit and retain service members, today we’d like to honor . . . If you’re a fan in the stands, at the end of the day, I think the key is that the military member is being sincerely honored. Period. Now, after the fact, knowing the honor is part of a paid sponsorship does diminish some of the good feeling the team derived from being patriotically generous. If Hometown Hero were the only component of the sponsorship, it would be highly problematic. But it’s not. The fact is that it’s just one element of an integrated marketing sponsorship whose average cost is $94,000 per year. A US Senator presented it out-of-context to make a political point, not to solve a problem, or to strengthen military recruitment, retention and overall armed forces brand-building. For me as a fan, and a citizen, the bottom line is this: Senator Flake, we have more pressing issues that require the attention of the US Senate. The Senator disagrees. Yesterday, he sent a letter to the US Secretary of Defense and the head of the National Guard to obtain total Department of Defense NFL sponsorship spending since 2009. He also wants to know the associated return on investment (ESPN.com). Stay tuned for more national media coverage of the Senator. If there’s really a public interest need to drill-down here, then let the Armed Services Committee review the totality of marketing and communications expenditures pertaining to military recruitment and retention. Oh, wait. Senator Flake isn’t a member. Hmm.